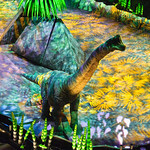 We went to Conseco Fieldhouse (Indianapolis, IN) last night to watch “Walk with the Dinosaurs”. My sister and her kids joined us and we all had a great time. It was a really cool show. This entry was posted in Pictures on July 10, 2009 by Eric T..